I learned today that the state of Michigan has 411 teams registered for the just launched FIRST (For Inspiration and Recognition of Science and Technology) robotics season. California is in a distant second place with 258 teams. The robots these teams create are designed, built, and tested by students to complete a challenge while competing against other teams. They are impressive to see in person. Maybe too impressive. I think that teachers often hear the term 'robotics' and believe they do not possess the skills needed to teach students this concept. Some see a shiny finished product and forget the process involved. Some are afraid to learn alongside their students. And some just do not know where to start. Hopefully this post will give you some ideas. Steve Swenson and Cindy Chaney teach a cognitively impaired classroom in Berrien Springs Middle School. They reached out to Berrien RESA inquiring about materials we had to support robotics. I sat down and talked about using Little Bits Gizmo's and Gadgets Kits and Sphero robots. They had never taught robotics before, were excited about the topic but nervous. Their background in teaching their students thematically allowed them to approach robotics in the same way. They wanted their students to build an understanding and see them in action. So before they even started building anything they visited Vickers Manufacturing. Vickers is a local machine shop and here the teachers set the stage for their students see the purpose and usefulness of robots. When it came time to get hands-on we discussed several starters. We agreed that the Little Bits were probably the best place to start with the students actually building, as they have very clear directions. The colorful instructions provided an anchor document for the small, cooperative groups Steve and Cindy utilized. We knew the students could build a working machine in a relatively short amount of time. From their they progressed to using OzoBots, Spheros and eventually the Lego EV3 programmable robots. The students were writing about their experiences throughout the unit and making other curricular connections. The teachers found benefit in providing their students with some initial time to explore and 'play' with the materials. The kids needed this exploration time before given a prompt or learning task. I think that the approach Steve and Cindy used in their classroom shows a great understanding of student learning. 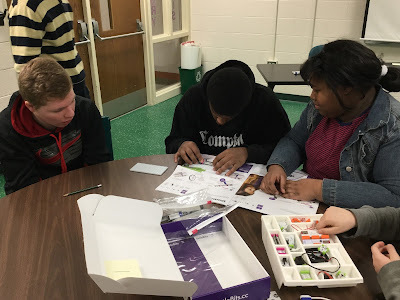 By creating real world connections for their students, and providing them with authentic tools, they were able to really engage the students with their learning. In fact, their curriculum director has encouraged them to have the students visit the elementary schools and teach the kids there more about robotics. I know I learned from their approach to robotics, and hope you will as well. If you're interested in using the materials described in the post please visit our Resource Requests page! I think that's a great way to approach learning! Who can prove that his children are the writers of their own speeches? Double check his bank account. In our world, write my speech is a daily deal. I really impress to your all post here is more information for us thanks for sharing this amazing post. run 2 game.